My first encounter with a compact was when my best friend forcibly put some on my face, years back. After that incident, I switched to compacts but always stayed loyal to Chambor. Recently, Nykaa launched their own range of Skin Genius Compacts. This range contains three shades- Natural Ivory, Warm Honey, Rose Beige. 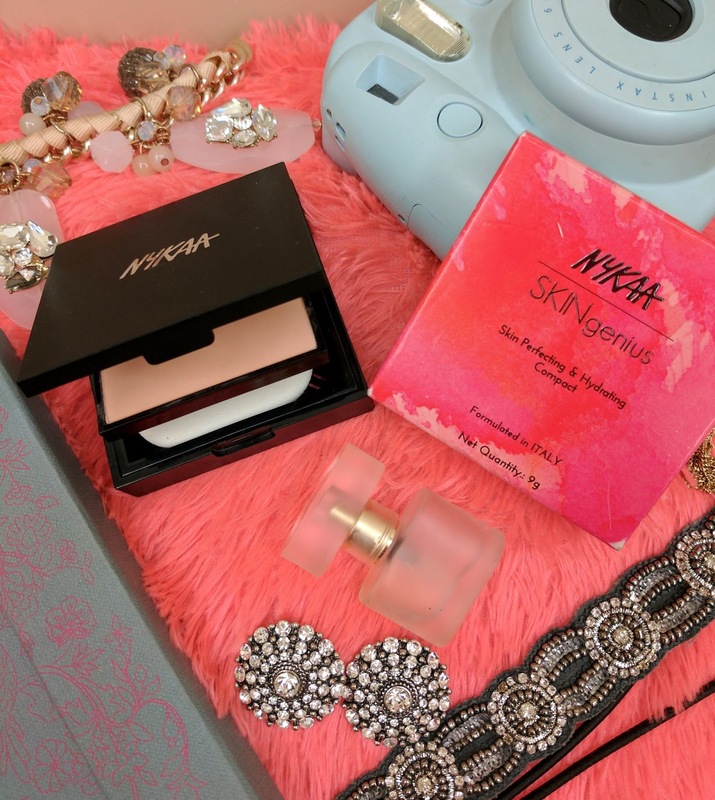 When I first saw the collection on Nykaa's website, I fell in love with their packaging. For heaven's sake, they had a separate compartment for the compact and a separate one for the blender. (Something which nobody can say no to!) The next thing I knew- I was adding the shade Rose Beige 02 to the cart and placing the order. For the ones who are skeptical of ordering online, my order came in three days in this pink box and was of top notch quality. Available for just Rs. 525, the Rose Beige 02 was perfect for my complexion. As my color is on the wheat-ish side, this shade perfectly blends on my skin. I prefer my compacts to not make me look white and should give a natural look on my face and this matte finish compact did exactly that for me. Oh, and it's texture is creamy and soft. For somebody like me who sweats like a pig, having a compact which helps me fight the oily look is actually a blessing. For me the deal breaker about this product was that it lasts all day long. (Which even the brand I was loyal to, couldn't offer) And anyway, nobody likes to put makeup on their face, 10 times a day. I hated doing that but since I had no other option, I went ahead and put compact on my face, again and again. In a nutshell, if you're looking for compacts that blend with your skin tone and help you survive the dreadful weather, go with the SKINGenius compacts range. You won't be disappointed. I know, I wasn't.